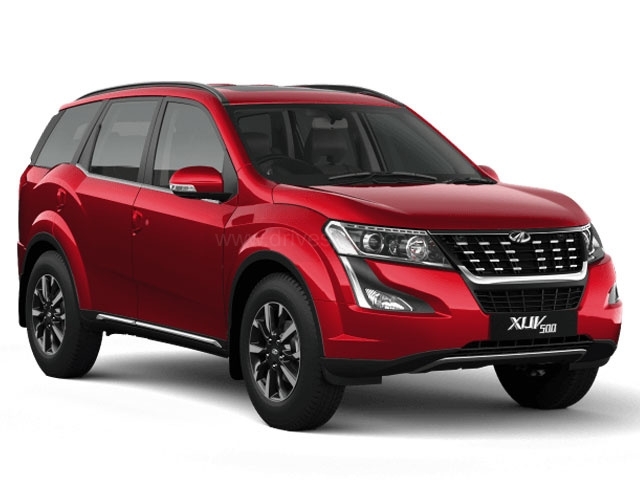 The Mahindra XUV500 is available in 12 variants and 8 colours. Here are more Mahindra XUV500 details such as prices, specifications and mileage. You can also check out the Mahindra XUV500 on-road price and EMI. Our detailed Mahindra XUV500 comparison further helps you compare the SUV with its rivals. DriveSpark brings you every Mahindra XUV500 information you would ever need. The Mahindra XUV 500 is currently in its third iteration. The `Cheetah-inspired` design of the XUV 500 was tweaked twice in its life cycle. Up front, the bumper and front grille feature a unique layout which might not meet everyone`s taste. The side profile of the latest version of the Mahindra XUV 500 is nearly identical to the previous models and has a neat treatment of chrome. However, it gets a new set of 18-inch alloy wheels. The rear of the new XUV 500 also brings some changes compared to the previous model. The main change comes in the form of the new tail lamp cluster. Still adding to its sportiness are the dual exhausts. The `Plush New XUV500` offers a lot of unique and class-leading equipment on the interior. The dashboard gets an ample amount of leather, brushed metal and piano black elements. Step inside the Mahindra XUV 500 and you will instantly observe a premium feel. The Mahindra XUV 500 is powered by a 2.2-litre mHawk diesel engine which makes 155bhp and 360Nm of torque. There is also a 2.2-litre petrol variant on offer. It makes 140bhp and 320Nm. The power plants are mated to either a six-speed manual or an automatic transmission (petrol model comes only as an automatic). Furthermore, the XUV 500 is available in both rear-wheel-drive and all-wheel-drive configurations. In terms of performance, the Mahindra XUV 500 showcases good dynamics, on and off the road. The suspension is well-tuned to adapt to Indian driving conditions and the XUV 500 packs enough punch as well. The Mahindra XUV 500 returns a claimed mileage figure of 15.4km/l for the diesel variant and 14km/l for the petrol version. The SUV has a 70-litre fuel tank; enough to go for long trips. As mentioned before, the Mahindra XUV 500 offers a lot on the inside. It gets a 7.0-inch touchscreen infotainment system, lots of leather, smartwatch connectivity, stability control, disc brakes on all four wheels and even an `emergency call function`. Tyre Pressure Monitoring System (TPMS) is also an added plus. The Mahindra XUV 500 is one of the best-selling seven-seater SUVs on the market right now. With the long list of features and equipment, it is still a strong rival to the Jeep Compass and Tata Harrier.